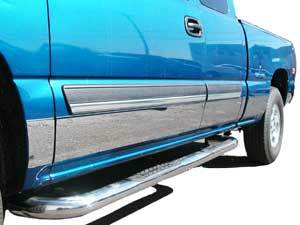 These high quality Stainless Steel Rocker Panels will enhance your vehicles appearance while providing an added level of protection against rust, chipping and peeling. Stainless steel is precision contoured to fit perfectly. Panels are 3” to 9” wide to cover rocker panels or lower part of door or bed (actual width, number of pieces and placement on vehicle depend on application). Corrosion and weather resistant. No drilling required. Rocker Panel set installs easily and securely with included 3-M adhesive backing.